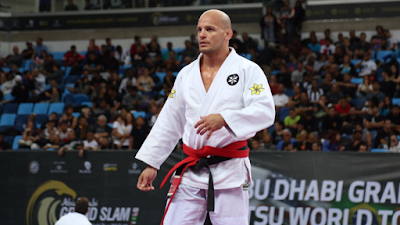 Jiu-jitsu.News: Why The Red Belt in Jiu-Jitsu Tournaments? Why The Red Belt in Jiu-Jitsu Tournaments? In UAEJJF competitions one competitor will always wear a red belt, with spectators wondering why. The red belt is used so referees and scorekeepers can communicate to each other which athlete will receive points during a match. Regardless of the color gi an athlete wears one will always wear a red belt in addition to his given rank. The referee signals when a competitor with the red belt scores by raising his right hand, which are then registered on the scoreboard in the red square next to his name. Sport is vital for children and teens! Jiu-Jitsu helped man lose 117 kg!